Ed. Note: Back in 2014 then Mayor Gray Announced Plans to Build New Hospital on St. Elizabeths East Campus. “Mayor Muriel Bowser today announced that her Administration and The George Washington University Hospital (GW Hospital) have signed a Letter of Intent to improve access to high quality healthcare services for Washingtonians, specifically for residents living in Wards 7 and 8. Together, the partners will develop a new acute care community hospital and health services complex located on the St. Elizabeths East campus in Ward 8, to be managed and operated by GW Hospital and fully integrated and aligned with the GW Hospital network of care and its affiliated faculty practice plan. The new hospital is expected to open in 2023 and include approximately 100-125 inpatient beds. This partnership, the first public-private partnership formed for the purpose of better meeting the health care needs of District residents, will help create the first new hospital to open in Washington, DC since the opening of the GW Hospital Foggy Bottom location almost 20 years ago. In addition to acute care and non-high risk obstetrics, the comprehensive health services complex at St. Elizabeths will include urgent care, outpatient surgery, diagnostic imaging and physician offices. Together, these services will create a network designed to improve access, care, and outcomes. The District has a budget of over $300 million in capital for the construction of a new hospital, including the construction of a parking garage. GW Hospital will invest more than $75 million over ten years. The signing of the Letter of Intent is the first step of the formal partnership process. Now, the District and GW Hospital will enter an exclusive negotiating period to draft a formal “partnership agreement” which will include all specifics of the partnership and will be submitted to the Council of the District of Columbia. The new hospital and health services complex will provide care as part of the GW Hospital integrated health system, including GW’s Foggy Bottom location where tertiary and critical care will continue to be offered. Additionally, the GW School of Medicine and Health Sciences and The GW Medical Faculty Associates will serve as the academic and physician arm of the new complex. Together, the GW enterprise will bring medical education, research, and technology to the new hospital and health services complex, creating an academic integrated medical network. “Throughout our history, GW has responded to the growing needs of our own community and society at large through our commitment to finding solutions to local, national and global problems. As such, we are delighted to partner with the District of Columbia, GW Hospital and the GW Medical Faculty Associates to address the compelling health care needs in Wards 7 and 8,” said Jeffrey S. Akman, MD, Vice President for Health Affairs, Walter A. Bloedorn Professor of Administrative Medicine, and Dean, GW School of Medicine and Health Sciences. 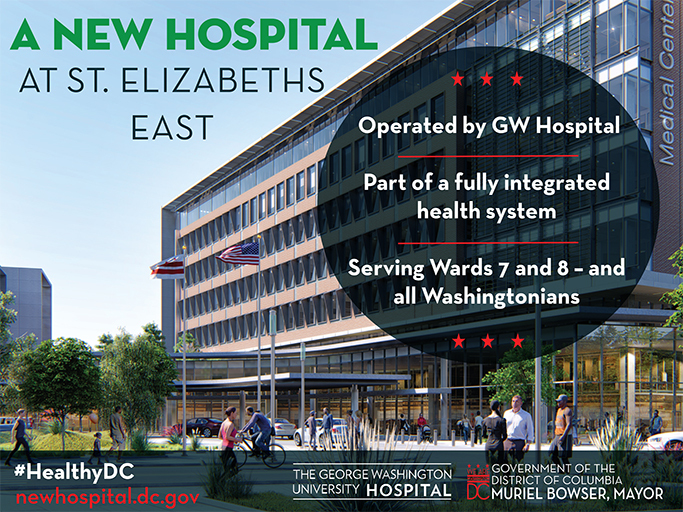 GW Hospital and its academic and physician partners have a long history of serving residents east of the Anacostia River, and this partnership is the next step in Mayor Bowser’s plan to bring a sustainable, state-of-the-art hospital to the St. Elizabeths East campus in Ward 8. The creation of a fully integrated medical network will also support the goals of the District’s Health Systems Plan. Released by the Mayor in September 2017, the plan outlines how the city will address chronic health inequities and provide timely, high quality and patient-centered care. The St. Elizabeths campus is part of a city development project that includes a two million-square-foot, 180-acre campus of residential, retail, and office space. The redevelopment follows the construction of the Entertainment and Sports Arena and the new headquarters of the Department of Homeland Security. As part of Mayor Bowser’s plan to make homelessness rare, brief, and nonrecurring, a new emergency and temporary housing facility will be built on the St. Elizabeths East campus by 2020 to replace the aging 801 East Men’s Shelter and provide a more dignified and program-rich facility for men experiencing homelessness.